Spraying raised beds only – shielded sprayer is covering the furrows. (Phys.org) —An innovative new approach to sugarcane plantation weed management trialled in select Great Barrier Reef (GBR) catchments has shown a 90 per cent reduction in runoff of highly soluble herbicides into waterways. In the lower Burdekin region of northern Australia, scientists from CSIRO's Water for a Healthy Country Flagship trialled a new technique for applying herbicides to raised beds of furrow irrigated sugar cane by using a specially adapted shielded sprayer. The technique minimises the likelihood of herbicides such as diuron, atrazine, ametryn and hexazinone coming into contact with irrigation water. Many of the herbicides used in the region are PSII herbicides that are known to negatively impact reef ecosystems. These waters discharge into the internationally recognised Great Barrier Reef World Heritage Area and subsequently into the Great Barrier Reef Marine Park. Improved farming techniques such as the shielded sprayer help keep herbicides on-farm have potential to have a significant and positive impact on water quality in the GBR. 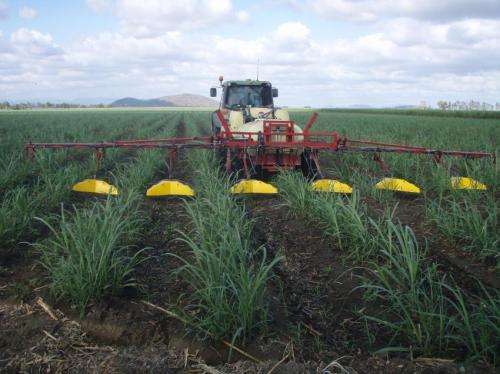 "The conventional application of herbicides in furrow-irrigated sugarcane production is to broadcast spray across the whole field using boom sprayers, which applies herbicides to both beds and furrows. Irrigation water then carries the herbicides with the tail water into the drainage channels, into nearby creeks and rivers and potentially into the GBR lagoon," CSIRO research leader, Dr Rai Kookana said. "Given the importance of improving GBR water quality additional testing and demonstration of these technologies across different soil types, farming systems - and possibly with different combinations of chemicals - would provide valuable additional testing of the approach from an industry perspective." "These trial results are extremely encouraging, and clearly demonstrate that the use of precision herbicide application technologies by the industry, including using shielded sprayers for furrow-irrigated sugarcane cultivation, can be highly effective in reducing herbicide run-off." CSIRO scientist Danni Oliver said the geography of the region meant that almost the entire flow from the Burdekin River Irrigation Area in the dry season (from July to January) was made up exclusively of irrigation water from sugarcane and other cropping. "The trials show that while there will certainly be some herbicide loss following the first irrigation or rainfall event, the marked decreases in losses documented in this study – a reduction of to 90 per cent - could lead to significant improvements in off-site water quality, particularly during the dry season," Ms Oliver said. According to Jon Brodie of James Cook University the amount of some herbicides in creek and estuarine waters during this period regularly exceeds Australian water quality guidelines and could potentially affect, for example, coastal seagrass. The results of the study have been published in the international journal Science of the Total Environment.